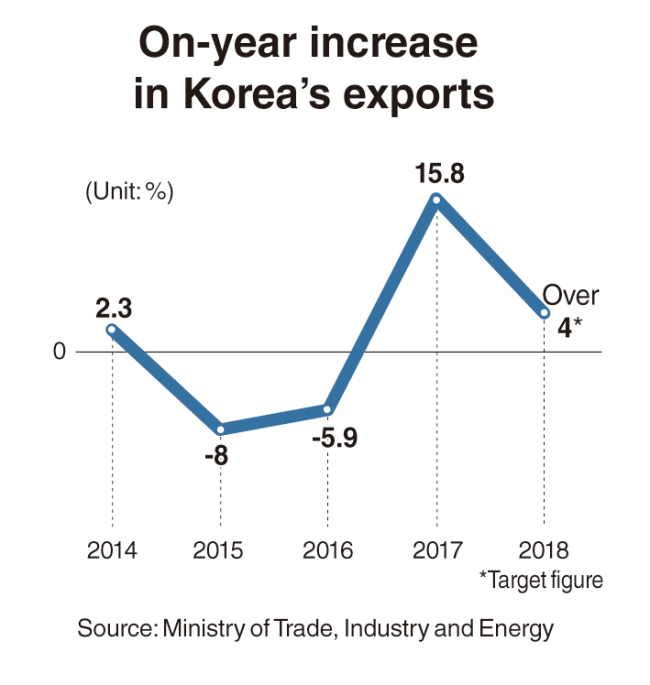 Trade officials here expect Korea’s exports will grow 4 percent on-year in 2018. The target is modest compared to last year’s 15.8 percent growth but will still be challenging, as worsening conditions, including the strengthening of the won, are weighing on exporters. Heo Yoon, the dean of the Graduate School of International Studies at Sogang University, said export growth would slow dramatically if such negative factors add to the high base effect. According to Trade Ministry data, Asia’s fourth-largest economy saw its outbound shipments soar to an all-time high of $573.9 billion last year on the back of an upturn in global demand. That figure was up from $495.4 billion a year earlier. With its products taking up 3.6 percent of the global market, Korea became the world’s sixth-largest exporter in 2017. The country’s trade volume exceeded $1 trillion last year for the first time in three years, as imports expanded 17.7 percent to $478.1 billion. The steep on-year increase in 2017 came after the country’s outbound shipments contracted in the previous two years. Nine of its 13 major export items posted growth. In particular, semiconductor exports soared 57.4 percent to a record high of $97.9 billion, expanding its share of the country’s total outbound shipments to 17 percent from 12.6 percent in 2016. Korea saw exports to all regional markets around the world, except for the Middle East, grow on-year last year. Outbound shipments to China, its largest trading partner, rose 14.2 percent to $13.8 billion, despite China’s retaliatory moves against Seoul’s hosting of an advanced US missile defense system. It is encouraging for the country’s exporters that global trade volume is expected to keep an upward trend this year. The World Trade Organization forecast in September last year that trade volume worldwide would expand 3.2 percent in 2018 following a 3.6 percent rise in 2017. Such a favorable external condition, however, is set to be offset by mounting trade protectionism around the globe, particularly in the US under President Donald Trump. The number of import restrictions on Korean products abroad continued to rise from 166 in 2014 to 175 in 2015, 184 in 2016 and 193 in the first 11 months of last year, according to data from the Korea International Trade Association. Korea’s exports to the US, its second-largest trading partner, increased 3.2 percent last year. But its trade surplus with the world’s biggest economy tumbled 22.7 percent to $18 billion, as it increased imports of US shale gas and machinery to ease pressure from the Trump administration. US trade pressure against Korea is expected to strengthen this year, as the two sides conduct negotiations to revise a bilateral free trade agreement, which Trump has described as a “horrible deal.” The first round of negotiations was held in Washington last week. US Commerce Secretary Wilbur Ross said in a recent forum sponsored by the Korea Foundation that Washington would self-initiate more anti-dumping investigations, if necessary. China’s push to expand the local supply of intermediary goods and Korean manufacturers’ moves to increase overseas production would also result in reducing the country’s exports. The more immediate concern for Korea’s exporters and trade policymakers is the continuous appreciation of the won against the US dollar. Partly due to the country’s heaping trade surplus and foreign investors’ net buying of Korean shares, the local currency appreciated 12.8 percent against the greenback last year, the highest annual gain in 13 years. In contrast, the Japanese yen rose a mere 3.7 percent against the dollar. The won-dollar exchange rate dropped to a three-year low of 1,061.2 won on Jan. 2 before edging up slightly in the following days. Analysts say this year may see the rate fall below 1,000 won if the geopolitical risk on the Korean Peninsula eases. During their meeting last week, Finance Minister Kim Dong-yeon and Bank of Korea Gov. Lee Ju-yeol agreed to take a “firm stance” against any excessive fluctuation in foreign exchange rates. “Foreign exchange rates are determined by the market, but we will come up with strong measures against any overshooting,” Lee told reporters after the meeting. But Seoul’s monetary authorities are limited in interfering in the foreign exchange market, as Korea is under the US Treasury Department’s watch for currency manipulation. The strengthening of the won is putting Korean carmakers and other manufacturers at a disadvantage particularly with Japanese rivals in overlapping export markets. A heavy reliance on semiconductors also carries the risk of a decline in demand dragging down the country’s overall outbound shipments. With domestic demand remaining sluggish, a slump in exports could cast a shadow on the prospect that Korea’s economy would grow more than 3 percent this year. Chung In-gyo, a professor of economics at Inha University, said Korean exporters should look for more opportunities in Southeast Asian and Latin American nations, while lessening dependence on China and the US, which accounted for 24.8 percent and 12 percent, respectively, of the country’s exports last year. He also noted Korea needs to step up efforts to increase exports of new industrial products and high-end consumer goods to reduce dependence on traditional major export items.